Oh Hitchbot, you captured our hearts with your charming wit, your warm smile, and your limbs all akimbo as you traveled through Canada and down through America. 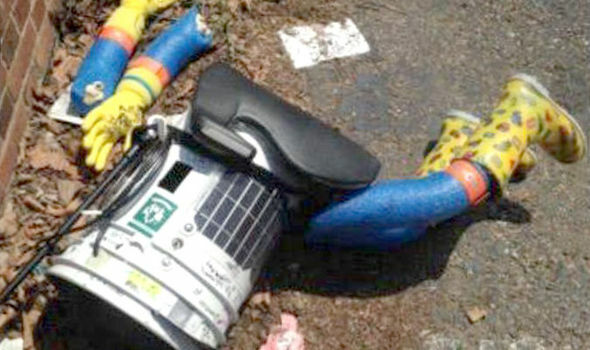 But then, this weekend, some horrible Philadelphian decided it would be “funny” and “amusing” to give HItchBot a swift kick in the face and destroy the defenseless tuna can. But, all is not lost. Engineers and scientists at The Coggin Toboggan knew they had the technology to rebuild him. They had the technology and capability to make him faster and stronger. Ladies and gentlemen, Hitchbot has been resurrected thanks to the Coggin Toboggan. Here is a video of us deploying him in the streets of South Jersey. He’s ready to go! Thanks everyone! What a great day for the city of Philadelphia!